For a costume that's creative and grown-up, dress up as a martini for your next Halloween. Whether you order the costume from a costume shop or make it yourself, it's an easily recognizable look, based on just a few elements. Variations are easy, making it possible to form a whole group of coordinated costumes, outfitted like a full liquor cabinet. Take inspiration for martini variations from the menu of your favorite cocktail bar. If your budget is limited but you have the time and the inclination for some creative crafting, you can design your own martini glass costume. Around your neck, wear a see-through cone-shaped collar designed for dogs, available either at veterinary clinics or pet supply shops. Wrap your body in clear plastic wrap to create the appearance of a long, slender base of the glass. To top off the look, wear a green ski mask to make your head resemble a martini's signature olive. For an additional final touch, you can paint a plastic child's sword in a neon color and set it within your "cup" in the style of a cocktail sword. If you'd rather leave costume-making to the professionals, you can find a martini glass costume through many of the more expansive costume shops. Look at online catalogs for shops with large inventories of unusual costumes for grown-ups. You might opt for a three-dimensional design with a large, clear, cone-shaped "cup" that resembles the homemade dog collar design. If you'd prefer a costume with better visibility and comfort, you can select one which restricts the "martini glass" design to below the neck and shoulders. 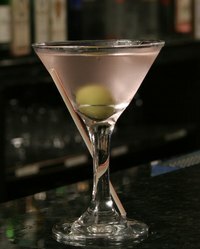 To personalize a generic martini glass look, you can use colorful cellophane paper to line the glass to resemble an appletini, chocolate-tini or your favorite concoction. If you design your costume yourself, you might opt for a splashy, over-sized design. Cut a large sheet of clear, rigid plastic into a circle measuring approximately four feet across, making one cut between the circle's center and a point on its circumference. Cut a hole out of the center of the circle, large enough to encircle your waist. Draw the edges together to form the circle into a three-dimensional cone. The cone serves as the martini glass's bowl. Wear it so that it sits at your waist, arching up and outwards. Keep a large green plastic ball inside, to serve as an olive. Your legs will serve as the stem of the glass. If you are a woman, you might wear platform or high-heeled shoes to lengthen the "stem."